GERMANY: Nordex's 230-metre high turbine has produced over 9GWh in its first year of operation, according to the manufacturer. The turbine is installed at the Hausbay-Bickenbach project in the Rhineland-Palatinate region of southwest Germany with average wind speeds of 6.1m/s. It is the tallest onshore turbine installed anywhere to-date, with a 164-metre hub height. Nordex said the turbine was not continuously available over the year due to "scheduled measuring activities", so total output could have been higher. "The volume of electricity generated proves that, especially for sites in regions with low average speeds, powerful turbines with a capacity of 3MW and more, with a large rotor sweep and high towers, are ideally suited for highly efficient operation," Nordex said. 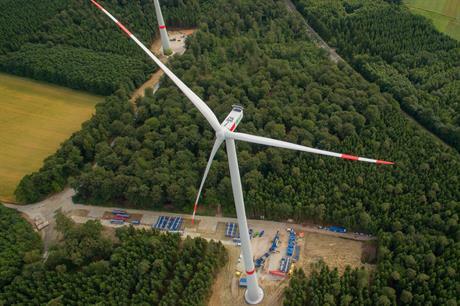 The CEO of project operator Kreuzberger und Spengler Regenerative Energie, Ulrich Kreuzberger, said he was "very satisfied" with the turbine's performance. Two more N131 3.3MW turbines at 164-metre hub heights will be installed at the site, Kreuzberger said.